Mrs. Shirley Louise George, age 96, passed away peacefully at home Wednesday, February 6, 2019. She was born at home in Muskegon Heights, MI on April 4, 1922 to Peter & Margaret (Gilmore) Hommes. 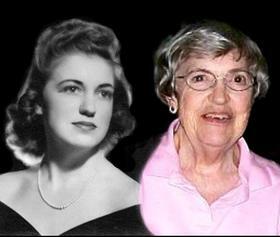 She married her high school sweetheart, Richard George, on February 22, 1944. They were happily married for 72 years until his passing in 2017. Mrs. George taught Kindergarten and 1st grade for Mona Shores Public Schools for over 23 years. Shirley was an artist, author, and loved birds, creating a bird sanctuary in her yard. She loved walking the shore and picnicking at Lake Michigan. She enjoyed researching her family genealogy and studying American History. Shirley was a member of Temple United Methodist Church and later, Central United Methodist Church. Shirley's love and support of her extended family will be greatly missed. Shirley is survived by her children, Eric (Jane) George, Rondi (Carlton) Fry, and Michelle (Peter) Chandler; 13 grandchildren; eight great grandchildren; brothers-in-law, H. Alfred (Rosalee) George and Thomas (Julie) George; many nieces and nephews; cousins, Margaret "Peg" Swineheart, Karen Wilson, and Nino Sidlauskas. She was preceded in death by her parents, husband Richard, and one granddaughter. Interment will be at a later date. In lieu of flowers, please consider a donation in Shirley's name to Hospice of North Ottawa Community,1061 S Beacon Blvd Suite 200, Grand Haven, MI 49417.